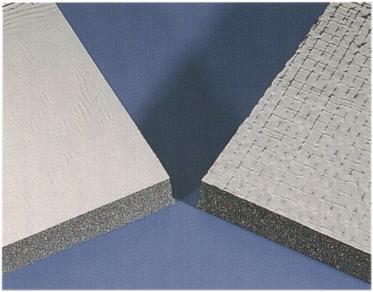 Hushcloth® Aluminized Polyester Faced Foams (AP) are used in environments hostile to an unprotected foam. These polyester films, plain and reinforced, offer abrasion resistance and are unaffected by moisture, lubricants, fuels, dirt and a variety of solvents. The film is easily wiped clean and seams may be taped for a finished appearance. • Potential to combine with Whispermat® barriers, Whisperdamp vibration damping sheet and Pressure sensitive adhesive for ease of application.